Mushrooms stuffed with crab meat, bread crumbs and Bleu Cheese swimming in a pool of butter and white wine. A perfect orderve for that special occassion, wedding appetizer or party you want to wow your guests with. In a medium size bowl add the bread crumbs, cheeses, garlic, butter, olive oil and herbs. Mix to blend. Stir in seafood. Stuff cleaned mushrooms place in a large baking dish, set aside. In a small pan melt the 1/4 cup butter with wine and olive oil. Pour around the bottom of the dish. Adding the extra stems of the mushrooms. Bake on a hot preheated oven of 375 degrees for around 35 minutes or until the mozzarella browned on top. Mmmmm - stuff my face with these! Suddenly I'm craving stuffed mushrooms - delicious sounding filling. Oh yum!! These look fantastic!! 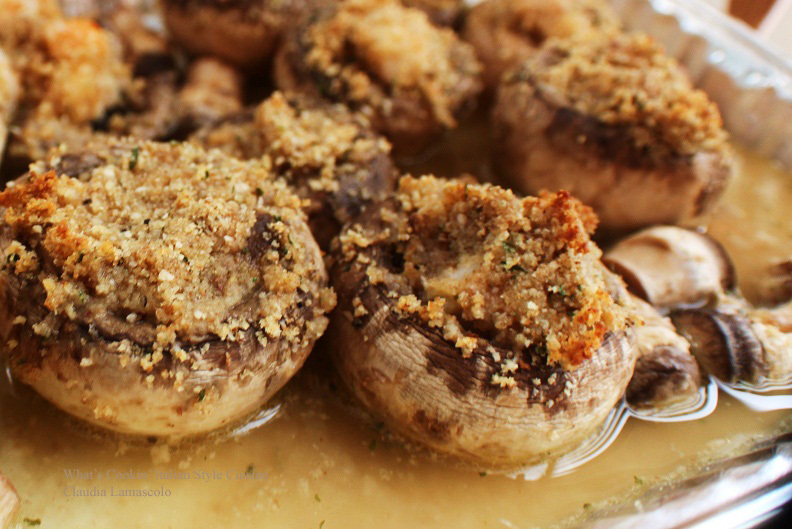 I just love stuffed mushrooms...so good!